The 2007 Aprovecho Stove Camp is almost 1 month away! We have reserved a group campsite at Dorena Lake (where Dean keeps his sailboat) just outside of Cottage Grove. If you plan on attending Stove Camp, and would like to stay at the campsite (cheaper than a hotel, and much more scenic), please contact Jeremy at Aprovecho to reserve a spot. Total cost per person is $40 for 5 nights. We have the site reserved from 7-15 through 7-19. There are also hotels in Cottage Grove and Creswell for approx. $60 - $100 /night. More information on the Aprovecho Stove Camp can be found on their website. The Aprovecho Stove Camp is a chance for people interested and involved in the research, design, construction, and dissemination of biomass cooking stoves to come together for a hands on collaborative event. Participants will discuss, design, build, and test cook stoves in Aprovecho's laboratory. Sessions for newcomers and stove veterans will run concurrently. Nordica MacCarty will do a training on how to use the Portable Emissions Monitoring System (PEMS) at Stove Camp July 16-20. We can evaluate emissions using the PEMS. Paul Anderson will teach a session on TLUD (Top Lit Updraft) stoves. We are awarding a $250 prize to the best natural draft stove...and doing a very thorough two day review called" Almost Everything About Stoves" that will run concurrently as folks build and test best stoves. (Two tracks happening at the same time). Tami Bond will probably be there and Dale Andreatta along with many other notables. Aprovecho has THREE COOL NEW STOVES to share. COME ONE, COME ALL! Directions, etc. to follow!! Sailing on the lake, too! 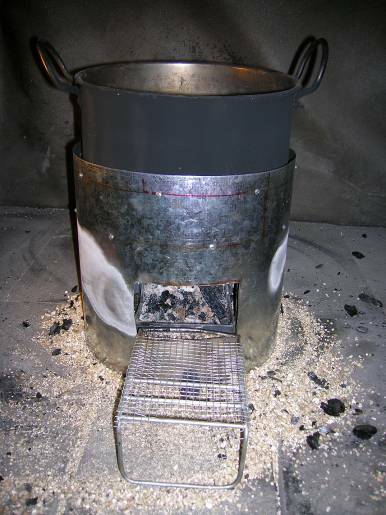 In an effort to understand the relationship between stove capacity and fuel use and emissions the performance of three sizes of rocket stoves were compared. The stoves were tested with the 2003 UCB revised Water Boiling Test. Pots that were integral to the stoves were used without a lid. Kiln dried Douglas fir at approximately 10% moisture content was burned in all tests. Only one test was performed on the household stoves. Therefore, results are not statistically valid but should be useful for general comparison. The [attached] graphs show results from three Rocket type stoves as compared to a carefully tended Three Stone Fire.